Unknown Fields is a nomadic design studio that ventures out on expeditions into the shadows cast by the contemporary city, to uncover the industrial ecologies and precarious wilderness its technology and culture set in motion. Tales from the Dark Side of the City is a book series that forms an atlas to the territories and stories of a city that stretches across the entire planet, a city that sits between documentary and fiction, a city of dislocated sites, of drone footage and hidden-camera investigations, of interviews and speculative narratives, of toxic objects and distributed matter from distant grounds. They are a collection of tales from the constellation of elsewheres that are conjured into being by the city’s wants and needs, fears and dreams. 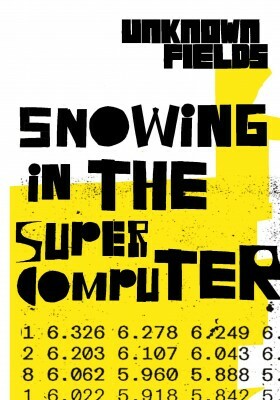 For Snowing in the Supercomputer Unknown Fields locate the environmental forecasts and data landscapes of the city and travel to Alaska’s far north, to visit a territory that sits in the collective imagination as one of the last remaining wildernesses. Unknown Fields spend the winter solstice with climate scientists from around the world who are camped out in the most northern cities on the planet to collect data that is fed into the climate-modelling supercomputers and environmental policies further south. Traditional data visualisations and guilt-laden headlines may no longer be sufficient strategies to encourage the cultural shift now required. 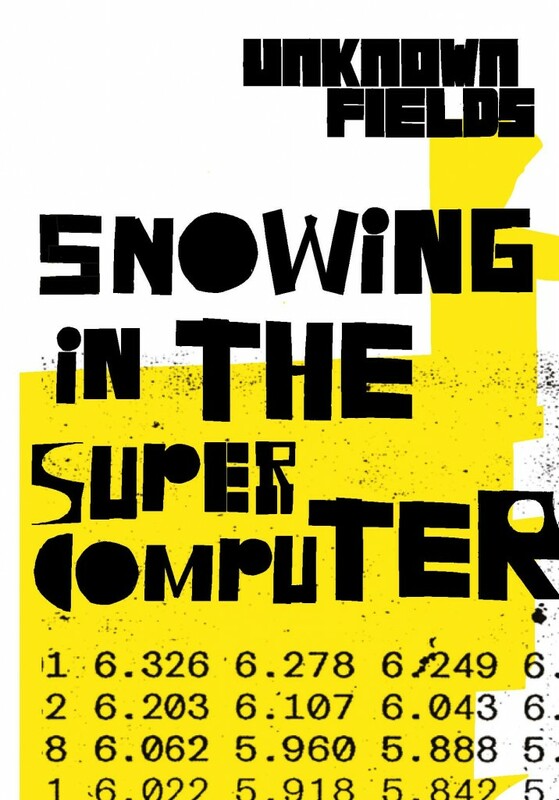 In this book Unknown Fields peers inside the supercomputer to find a set of surreal landscapes that sit between tradition and technology, the real and the imagined, the present and the future. They are landscapes given new narratives by native Alaskan authors and generated from the climate data and modelling software of supercomputer scientists. Against these images run panoramas of the supercomputer infrastructure that simulates them and the doomsday statistics that are shouted at us everyday, but that we do our best to ignore. Other books in the series includes stories developed from expeditions through Bolivia and the Atacama Desert, the Western Australian Outback, the South China Sea and Inner Mongolia, the gemfields of Madagascar and the black sites of the United States. London, 2016, 17x24cm, illustrated, 64pp, Paperback.